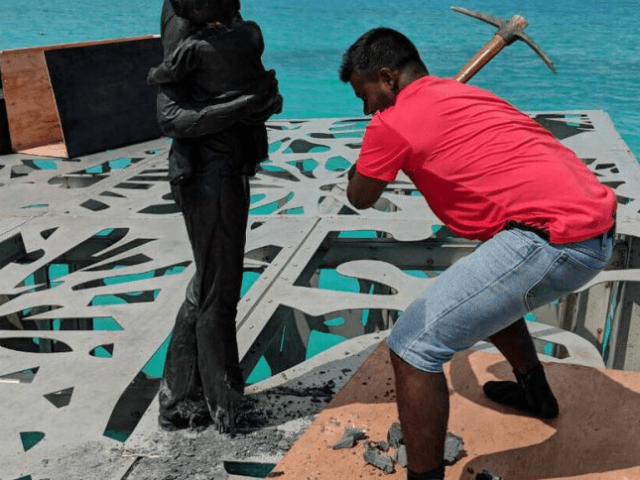 (AFP) COLOMBO, Sri Lanka — Police armed with pickaxes and power tools have destroyed a modern artwork by a celebrated British sculptor in the Maldives, after the outgoing president in the tourist haven declared the installation offensive to Islam. Yameen said in July that “significant public sentiment” against the artwork known as “Coralarium” had guided his decision to destroy it. “I was extremely shocked and heartbroken to learn that my sculptures have been destroyed by the Maldivian authorities at the Coralarium, despite continued consultations and dialogue,” deCaires Taylor told AFP in a statement. “The Coralarium was conceived to connect humans to the environment and a nurturing space for marine life to thrive. Nothing else! Despite the edict, huge cutouts of Yameen towered over the capital Male in the lead-up to Sunday’s poll, which he lost after five years of strongman rule marked by a regression from democracy.